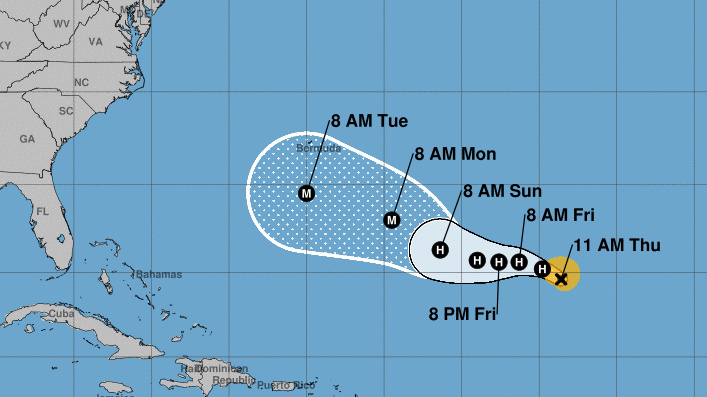 The forecast for Florence currently has the storm's eye passing south of Bermuda. By that time, it will be a major hurricane, forecasters say. Florence was packing maximum sustained winds of 105 mph as of late Thursday morning, the hurricane center said. That marked a drop from one day earlier, when Florence suddenly strengthened and sustained winds hit 130 mph — making it the first major hurricane of the 2018 Atlantic season. Forecasters say Florence is likely to weaken further over the next day or two and then regain strength as it nears Bermuda and the U.S. The storm is currently over the open ocean, more than 1,000 miles east-southeast of Bermuda, moving northwest at 10 mph. In Bermuda, a government spokeswoman tells The Royal Gazette that although the storm isn't currently considered a threat, it's a good time for people on the island to "update their storm supply kits." And the National Weather Service office in Charleston, S.C., says that while it's too early to speculate about where Florence could possibly hit the U.S., "it's best to dust off your hurricane plans and stay tuned!" Acknowledging "large uncertainty" over the hurricane's extended path, the National Hurricane Center said that "large swells emanating from the hurricane will reach Bermuda beginning on Friday and portions of the U.S. East Coast this weekend, resulting in life-threatening surf and rip currents." The storm's path has indeed proven tricky to predict: While previous tracks called for Florence to take a more north-northwesterly approach, the latest track shows a flatter, more northwestern and western path. It had once seemed likely the hurricane's eye would pass north of Bermuda; it's now predicted to pass south of the island.